The first factor is the equipment’s age. 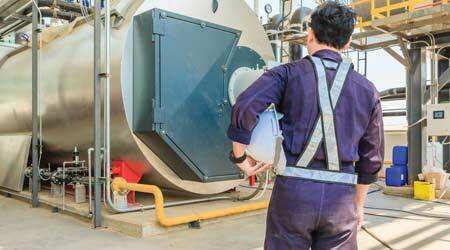 As commercial boilers age, maintenance costs rise. Unless something serious goes wrong, replacement costs will always exceed repair costs. But the trend in maintenance costs is a more important factor. If these costs remain relatively constant, repairing the boiler most likely is the better option. Consistently and rapidly increasing costs point toward replacement, as does difficulty in obtaining replacement parts. Next, managers should review the operations and repair history. Identical boilers operating in similar facilities often have widely different operations histories. Differences in set-up, operating practices, and maintenance cause these variations. Operators and managers need to review the boiler’s history to determine whether factors exist that suggest replacement is the better option. Then review the efficiency. New-generation boilers offer major increases in annual operating efficiency compared to boilers that are only 10 years old. Managers should consider the annual savings from replacement when evaluating options. Finally, managers should look at the boiler’s configuration. Older boiler systems tend to include only one or two large units. One result of that set-up is that it often was necessary to cycle one boiler to match part-load operating conditions. New-generation, centralized systems use several smaller, modular boilers. This design allows operators to better match system capacity to facility needs, resulting in improved operating efficiency. Managers should review the historical building loads to see if a cost benefit exists for replacement with modular boilers. James Piper, P.E., is a national consultant based in Bowie, Md., with more than 35 years of experience with facilities management, maintenance and engineering issues.